You may find it surprising that after yesterday's post, I write a post about two addons. The solution is simple: while an addon is here, you must use it or be incompetitive. 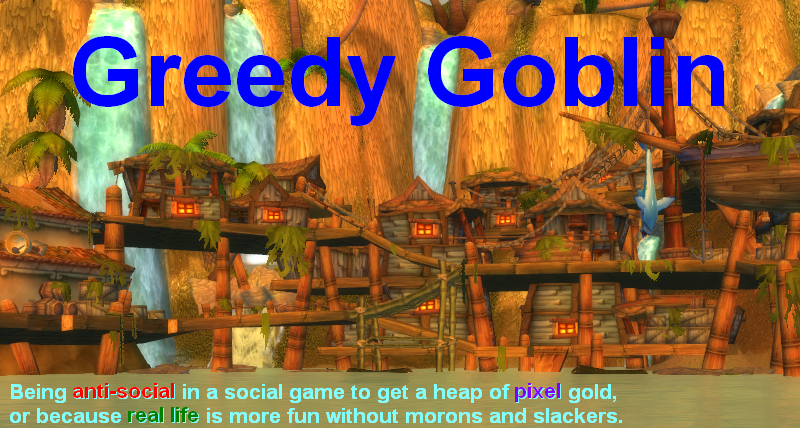 The LilSparky's workshop is a simple, but very handy addon, its effect can be seen on the picture. It shows my tradeskill window and as you can see, it shows the Auctioneer prices next to each item, so you can find what's profitable and what is a cheap leveling item. This way you can quickly find what to craft. Credits: I found this addon in this post. Batch posting is a handy option in Auctioneer's Appraiser module. If you sell the same things every day, you just select these items, set the price model and the stack size, just like normal postings. But instead of "Post item", you select the "Enable Batch Posting" option in the top right corner. When you done it, you Ctrl-Alt-Shift-Click on the "Batch Posting" Button and all the selected items are posted. What's the point? Auctioneer remember the "Enable Batch Posting" options, so tomorrow you won't have to select them again. You just click Ctrl-Alt-Shift-Click again and you are done. These two have saved me 20 mins every second day when I manage the glyph industry. I've updated the post about it. These are amazing time-savers for people making glyphs, but for most of us (eg, people making epic spell thread or NW bags, etc) it's not that helpful. Gevlon, sorry to go off-topic, but I'm trying to find a way to track which of my activities is netting the best gold/hr. I read your post on "booking" (which I would call "accounting"), but given that I have 4 accounts and play on 5 servers, it seems like the accounting would be a nightmare. Are you aware of any add-ons that help do accounting? Cheers! Thanks for the tip, "booking" is replaced by "accounting"
I don't know if an addon could really sort that information. Granted I'm new to trading and actually making any sort of money in WoW :P but don't a lot of the actions overlap which would make it hard to figure out how to associate them? I'm a beancounter-guy myself - but being a datacruncher-at-heart I would love to have some way to analyze the data further. Either an ingame addon or a way to export the data to CSV, XLS or similar. Anyone know of any tools to do something like this? I've looked at the beancounter save-file, but I think it would be a stretch to call it "easily accessible"
One of my mods (I'm not sure which one anymore, all I remember is that it isn't something that mod is supposed to do) lets me have my crafting window and my aucion window open at the same time. 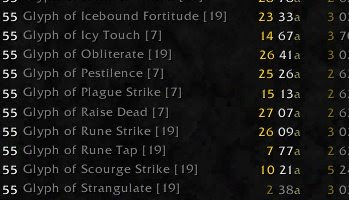 I just go down the list and shift-click them, crafting whichever glyphs are currently up for over 10g. And I know I'm part of the minority here, but I find Auctioneer to be WAY too complicated. I prefer a smaller mod called AuctionMaster for my auctioning, because it lets me just undercut the current auctions. The price it's showing that it costs to make the item is wrong, though. It adds up the price of the components needed to make the item, but it doesn't break them down. So, if an item takes 1 jadefire ink, it'll list the average market price for jadefire ink. But you may be getting jadefire ink for a very different price if you are buying the herbs and breaking them down. @Kiryn: I agree, Auctioneer is too bloated. I used to use AuctionMaster, but now I've switched to AuctionLite. It lets you undercut current auctions just like AuctionMaster, but it also has a nice buy tab that sorts your searches by item and lets you do mass buyouts. Saves me a ton of time. Regarding the request for a mod/tool that would help with booking/accounting, I too am in dire need of something. I tried making a spreadsheet, but am obviously an Excel dummy. I don't even need a mod, but a spreadsheet(data removed, of course, but a template, perhaps) would be a lifesaver. As it is, I'm using a variety of .txt files. A horrible state of affairs, but I can't figure out how to make excel track purchases and production and sales and hook them all together, so I know that the 16 stacks of saronite cost me 320g but I made 80 gems out of it and have sold 20 gems for 500g, and let me see that I am in the green by 180g on *that* purchase. Oi. But shouldn't you consider selling the ink instead if you are creating ink for so much less than the market value? The inks rarely sell, there is no market for them. Auctioneer gets a 'market price' from a few ink postings than probably never sell, making the LilSparky price off. I see the same issue with Parchments. LilSparky uses the price from Auctioneer, where a few people are trying to sell parchment at inflated prices. What I did to fix this was go into each item in Auctioneer and set a fixed price for these items. LilSparky then uses my fixed price. Now that's a good idea. I hadn't thought of that.